After the last post about the 2 twin chairs, I got questions and emails about how to do the finishing upholstery work on them. 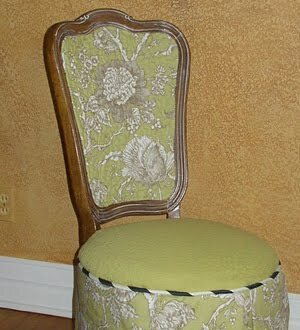 Although I am not an expert at upholstering furniture here are some tricks I've learned along the way. This post is for the back, I'll be back with a shorter one for the front. I started with a nice, older Thomasville cane back chair. A much better version of the ones in the last post. But they are all made in a similar way and can be covered to update, change or to cover up in the case of the really cheapy ones. This one I've had since it was new in 1986 as part of a set. I still love them, the pecan wood is beautiful. I would not paint them, but I've changed the fabric a few dozen times. 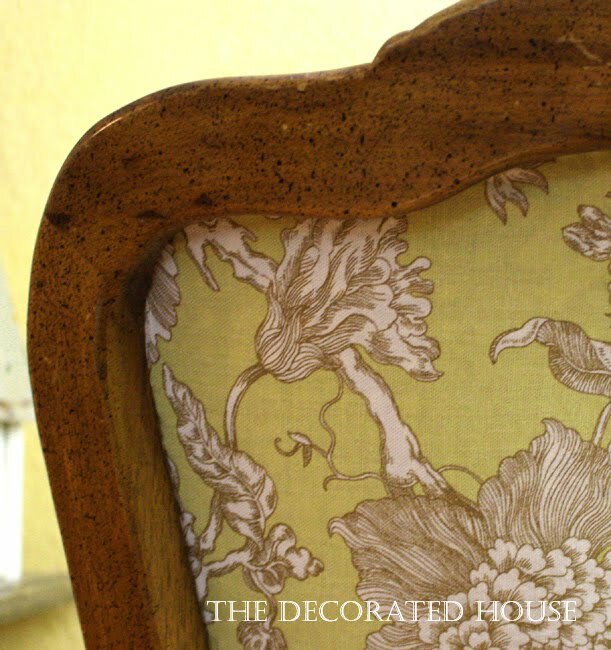 The lime green and brown toile that is on them now is still one of my favorite fabrics. When you look closely, you will see that the cane is on the front and then there is a piece of wood holding it in place from the back. Turn the chair around and look at the back and you will see the the cane is snuggly inside that area you just looked at on the front. This is the view from the back. Gently push the cane away from you. See, there is a tiny space.That is where the fabric goes. You have about a half inch of room. So you do need to cut it pretty close, but this isn't that hard at all. Start with a larger piece of paper at least the size of the back of the chair in order to make a template. I've used newspaper in a pinch, but be careful of the ink getting on your hands and then getting on your fabric. 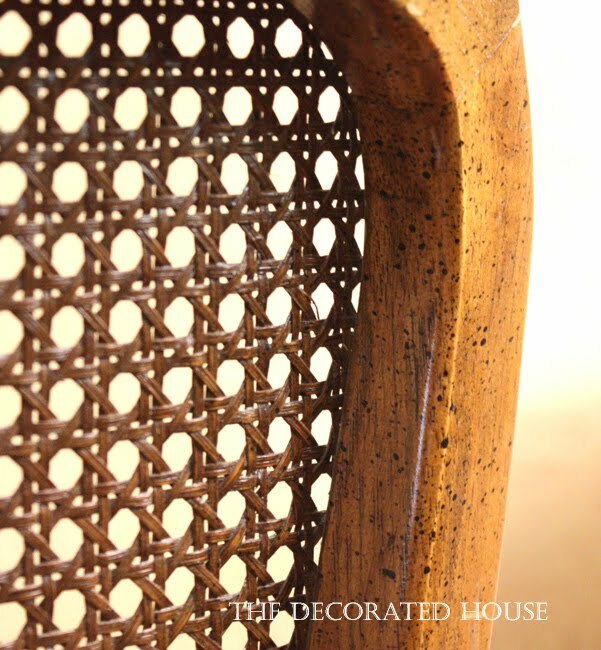 Lay this piece of the paper that you cut about the size of the opening plus a few inches, against the back of the chair and draw a template for the area of back of the chair where the cane shows through. Use a pencil to draw along the edge as your press the paper against the chair. Try to make it the exact size of the opening. Cut it out, try it on for size, and if it's not quite right just start over again, it's only paper! TIP: After you have your drawing, be sure to mark the template FRONT as the SIDE FACING YOU as you draw, and mark Left & Right. The opening will be a different from side to side. And you may want to center a pattern. The front will be the front side of the fabric. Now take the perfect fitting template and make a new one by using a ruler and just mark line or dashes around it, about 1/2 inch larger. Connect your dashes and cut it out. After you see that the fabric is the perfect size, cut a piece of fabric to test. You can make the test piece out of cheap fabric like an old sheet or muslin. You want to make sure that it really is perfect before cutting your actual fabric. Lay the test piece against the chair back and center it so that it is the fabric is 1/2 inch past the inset area on all sides. Tuck in a little on each side to make sure you don't have too much excess fabric, then remove. Cut the actual fabric now using the the paper template that you have adjusting if needed after seeing how the test piece fits. 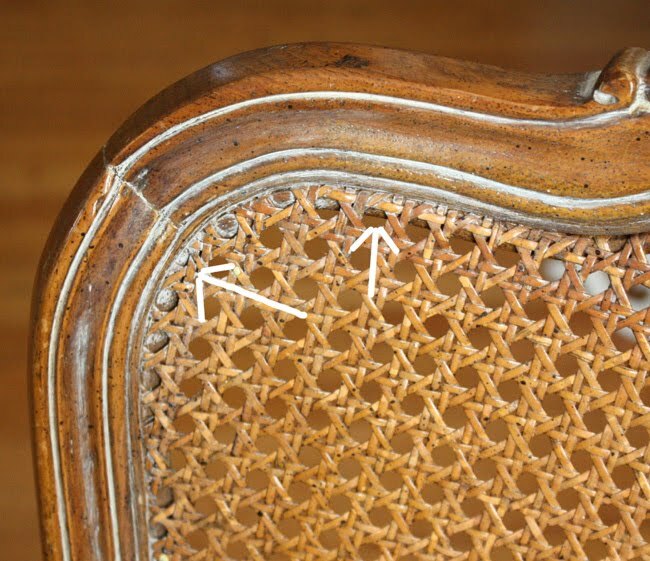 Now, gently push the fabric into the area between the cane and the back of the chair, with a blunt tool. A butter knife from your eating utensils works well, or a large flat head screwdriver. Your are "stretching" this piece, which means that you start at the middle of on side and go to the middle of the opposite side, and then the middle top and middle bottom. Back to the beginning side, tuck and go to the opposite side. Then you work your way in a little a time 3 or 4 tucks then go the opposite side. This will keep the fabric centered, too. The fronts of these chairs were done differently than the thrift stores ones, but I'll show you both ways in the next post. I ADORE this fabric and on the chair?? DIVINE!! Thank you for this tutorial. Can't wait for the next post! from the looks of things, we might be related, at least soul mates. Thanks for sharing the "how-to" for this project. Fabulous makeover Donna!!! Thanks for sharing your tips here!!! A friend of mine just introduced me to your blog! It's beautiful! Can't wait to visit again. THANK YOU!! I have been searching ALL day for some instructions on how to do this - or even if it was possible. I can't wait to get home and try it! PS: Can you add any padding to it? Like glue it to the can before you put the fabric on?